EXTRA LARGE WIDE ANGLE MIRROR - Huge 12" x 8" Wide Angle Display. Always See Your Little One in Crystal Clear HD! NO ASSEMBLE REQUIRED - Our Mirror comes already assembled and is ready to mount straight out of the box! Simply Unpack & Attach. It's that Easy! 100% SAFE WITH SHATTERPROOF DESIGN - Made from Acrylic Safety Glass Surrounded By a Black Plastic Frame. In the event of a Crash or Accident you can ensure your Child is Safe! FULLY ADJUSTABLE & COMPATIBLE WITH MOST VEHICLES - 360 Degree Pivot for full maneuverability. Attaches to Any Headrest. Fits Most Cars, Vans, SUVs, & Trucks! 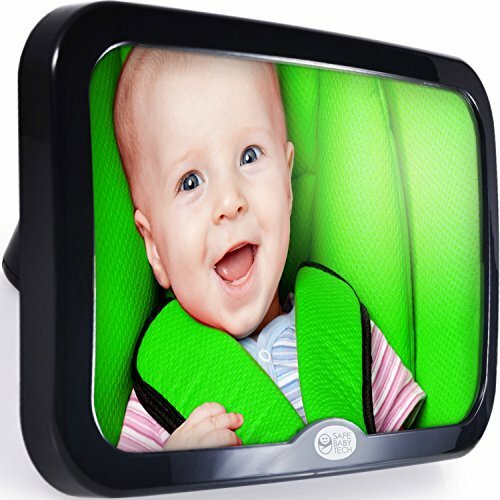 MANUFACTURER MONEY BACK GUARANTEE - If at any point you're unsatisfied with your SafeBabyTech Baby Mirror simply return it to us for a Full Refund. If you have any questions about this product by Safe Baby Tech, contact us by completing and submitting the form below. If you are looking for a specif part number, please include it with your message.